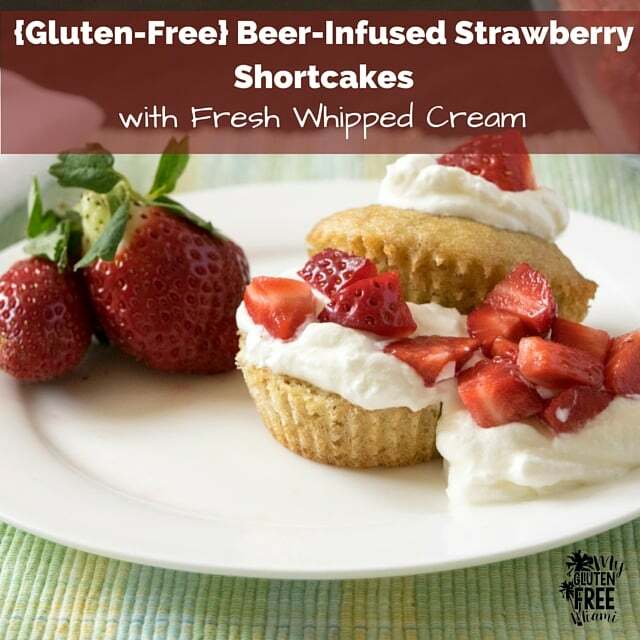 Paired with fresh strawberries and whipped cream, these beer-infused cakes are a delicious treat! It is strawberry season here….yes, I said strawberry season. While everyone up north is freezing, down here in South Florida we are just beginning to harvest. U-pick farms will open soon and there will be an abundance of sweet, ripe strawberries. Why would you put beer in a Strawberry Shortcake? Normally, I wouldn’t, but awhile back I was in the midst of taste testing gluten-free beers for the 8 Gluten-Free Beers to Celebrate Oktoberfest post and I came across New Planet’s Blonde Ale. I had already planned to use one of the beers for a recipe, and had been thinking brownies, but the crisp sweet taste of the Blonde Ale made me think dessert and I wanted to use it. I remembered I had a bag of Bob’s Red Mill Vanilla Cupcake mix sitting in the pantry and a thought of genius struck me. Why not use the beer to make the cupcakes? No one is paying me for this idea (though if they wanted to I would not refuse! ), it was just a light bulb moment. I originally tried out these cupcakes in October, but I wanted to wait until strawberries were in season to share! It was so easy and so delicious. The beer mellowed out the sweetness and reminded me more of a shortcake than a cupcake. They rose wonderfully and had a fantastic texture. Our beer testing crew loved them, no one ever would have known they were gluten-free. There was not one bit of grit to them. Despite the love of the cupcakes, they were missing something. No one could really agree on what type of icing would be best. After much debate, we realized that because the texture is somewhere between a muffin and cake it would hold up nicely to some fresh whipped cream and sliced strawberries. Amazing. You need to try this. I am sure you could use another beer, but it needs to be light and a bit on the sweet side. Redbridge would work well, or even a hard cider would probably be good. I have not tried this with any other gluten-free cake mix, but I would assume that they would generally come out the same. They sell the Bob’s Red Mill Vanilla Cake Mix at my local Big Lots and it is fairly inexpensive. Altogether this recipe costs about $10.00 to make and makes at least 8 servings (with several cakes left over). If you try it with a different cake mix or a different beer be sure to let me know the outcome, but for today, here is my very simple, Beer-Infused Strawberry Shortcakes. Preheat the oven to 325. Beat the 3 eggs for 30 seconds and then add the beer and vegetable oil. Continue beating for another 2 minutes. Be sure to scrape the sides. Spoon into a greased (or paper lined) cupcake pan, leaving about a half inch at the top. Bake for 25 minutes. While the cupcakes are cooling, whip the cream with the vanilla and sugar until it forms soft peaks. Slice cupcakes in half and top with whipped cream and sliced berries. Beat the 3 eggs for 30 seconds and then add the cake mix, beer and vegetable oil. Continue beating for another 2 minutes. Be sure to scrape the sides. Spoon into a greased (or paper lined) cupcake pan, leaving about a half inch at the top. While the cupcakes are cooling, whip the cream with the vanilla and sugar until it forms soft peaks. Slice cupcakes in half and top with whipped cream and sliced berries. These look absolutely amazing. I didn’t know that Bob’s Red Mill had cake mixes – I will have to check them out. 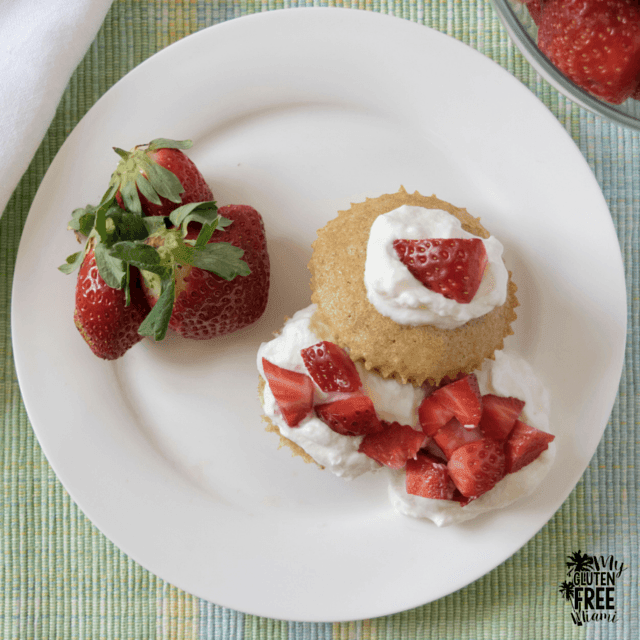 This is a fun idea, like strawberry short cakes are all grown up! So fun and creative. I love that you put beer in the shortcakes! Thanks! It was a moment of genius, I was originally thinking brownies, but then I saw the cake mix sitting there and thought, why not? Now I’m craving a cake with beer in it – and it’s only 10am. Is that even legal? It’s never too early for cake! OK, I am kind of jealous you are getting fresh strawberries right now…sigh…I am not longing for summer, but fresh berries…PLEASE! It’s one of the great things about South Florida, our growing season is reversed from most areas of the country. … I’m sure if would work with some frozen berries as well! I live in SW Florida and love our winter strawberry season. Will definitely give this a try. It’s great! I love that when everyone else is freezing we get fresh fruit! What a fun way to infuse some GF alcohol! Fabulous strawberry treat! Thanks Rebecca! I thought it was a great way to use it and I feel like it really enhanced the texture :). I haven’t tried with making cakes with coke, I’m going to have to try that now! I hope you give this recipe a try when your strawberry season rolls around :). Love love love strawberry season. We’re not quite there in California, but we are getting so close that I can almost taste it! I’ve never tried baking with beer, but it sounds kind of amazing! Those shortcakes sure do look delicious. Strawberry season is the best! I look forward to it every year, it makes such a difference in the quality of the strawberries that are available! So few ingredients and the best dessert! Perfect for Valentine’s Day! It is so simple, I almost didn’t even post it! Then I realized that everyone is always looking for something quick and easy, that tastes spectacular! Hi Christie, I never though to bake with wine. I am going to have to try that out! This is a very cool idea and while I’m not gluten free – I’ll eat virtually anything, so this is now on my to-make list! BTW – I’m a South Florida girl – heading to the farmers market in the morning to get some Plant City strawberries. The best part about these, is that even if you aren’t gluten-free they taste great. Because of my celiacs, we don’t use any products with gluten, but none of our friends ever know the difference! I am a sucker for anything that is cooking or baking with beer! This sounds and looks awesome! !